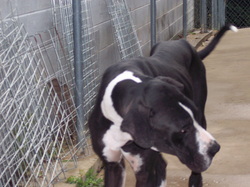 Danny Boy - Great Dane arrived at GreenePets 6/1/2012 - Adopted! Danny Boy was found roaming last Christmas Eve. He was terribly under nourished, had entropic eyelids, and a growth on one of his legs. His rescuer, kept him for several months while all the medical issues were addressed, including his neuter. Danny Boy is a fun loving joe, he loves to play with other dogs, and loves people. When he really adores you, you will be fortunate and receive a Whack with his head. Too much.